(Newser) – The drowning deaths of six people thrown from a whale-watching vessel that capsized off Canada's West Coast in 2015 have been ruled accidental, but that's not stopping a coroner from proposing a big change to prevent such a tragedy from happening again. 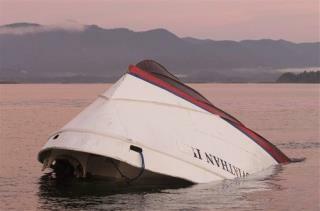 In a report out Tuesday, Courtney Cote of the British Columbia Coroners Service says life jackets were "the only variable" that could've prevented the deaths of five Britons and an Australian shortly after a wave flipped the Leviathan II, carrying 27 people, as "witness statements indicate five of the six were unresponsive within two to three minutes," per the Canadian Press. Though Transport Canada requires small commercial vessels to have life jackets accessible to all passengers, Cote now recommends they be worn by all on outer decks of boats larger than 15 gross tons and carrying more than 12 people. Whales have overturned boats so life , jackets should be mandatory , it's obvious . There wasn't a report of the water temperature. Thermal Shock, commonly called hypothermia, causes a human body to rapidly become comatose when immersed in water of 40* or less. It takes only 5 minutes to lower the bodies core temp into dangerous range. Survival is limited to being immersed for 15 minutes at that temp. When the body's core temp reaches 85* it is fatal. On the other hand if life jackets had been worn, and the water temp was survivable, wouldn't this tragedy have been prevented? How did 22 of the 27 survive? Or maybe instead of regulations up the wazoo, we humans, being non-aquatic, agree to stay off the top of water. And if we choose to do so, we accept the risk. Why is this so difficult?